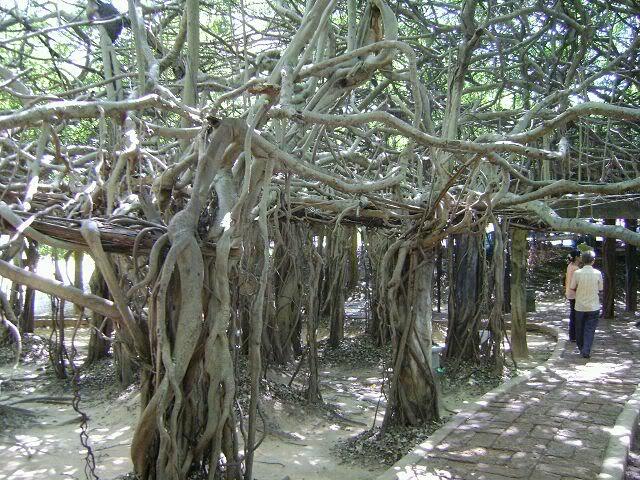 Another spot of interest could be Thailand's largest and oldest banyan tree, located a bit east of Phi Mai town. Basically it is one single and enormously huge plant located in a swamp-like area. The extensive system of interlocking branches and gnarled trunks makes the 'Beautiful Banyon' look like a small forest. The total area covered by this plant is about 35.000 square feet and its age is estimated to be about 350 years. The name "sai-ngam" was given to it by the 5th Queen when she visited Phi Mai for sightseeing on January 21, 1911. There are maintained walkways below the tree. Opposite the tree area there are open air restaurants and plenty of souvenir shops.